It’s time to get back into the swing of things! Summer’s over, kids are back in school, and everyone’s trying to fall into a normal routine. No matter how busy things may be, there’s one thing that shouldn’t be sacrificed: family dinnertime. According to The Family Dinner Project, “sharing a family meal is good for the spirit, the brain, and the health of all family members.” They suggest that families eat meals together at least five times a week, to reap all of the benefits. Now, we know this is tough with everyone’s crazy schedules, but with some planning and some easy, family-friendly recipes to choose from – you can totally do this! Today, I’m going to share a recipe with you for a Ham and Cheese Lasagna from MrFood.com. Not only is this made with ingredients that both kids and adults like, but it also includes a serving of veggies! 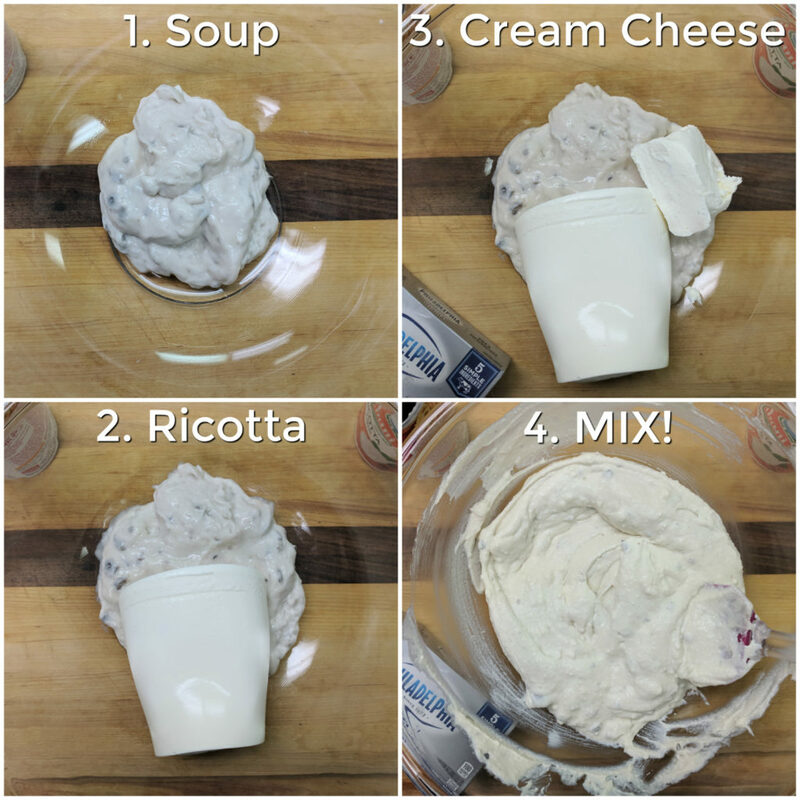 It’s creamy, it’s cheesy, and it’s really easy to make – so easy, the kids can help! Step One: Get all of your ingredients. 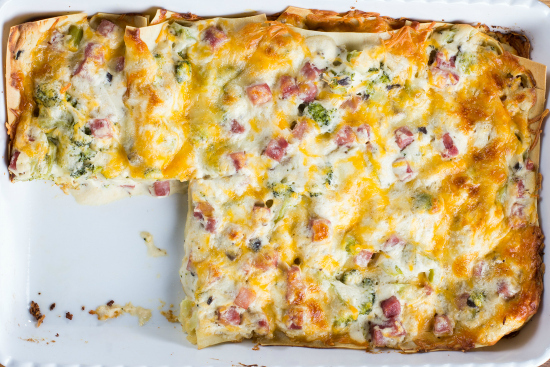 To make this lasagna recipe, you’ll need cream of mushroom soup, ricotta cheese, cream cheese, broccoli, chopped ham, oven-ready lasagna noodles, mozzarella cheese, and cheddar jack cheese. Starting with a package of frozen, microwave-ready broccoli makes this super easy and convenient. 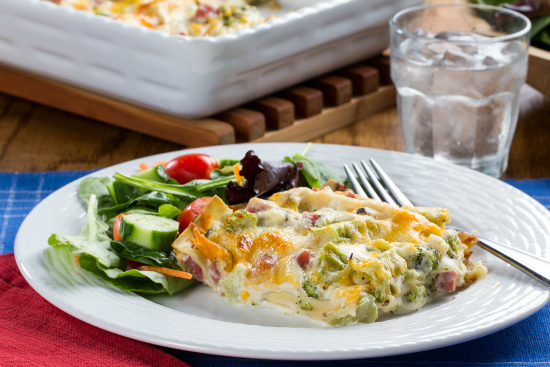 If your family isn’t a fan of broccoli, you could always use a different veggie – we just happen to think that broccoli and cheese pair perfectly together! Step Two: Combine the soup, ricotta cheese, and cream cheese. Mix it well, before adding the broccoli and ham and mixing it again. Step Three: Time to start layering! First, spread 1/3 of the broccoli mixture over the bottom of a baking dish. 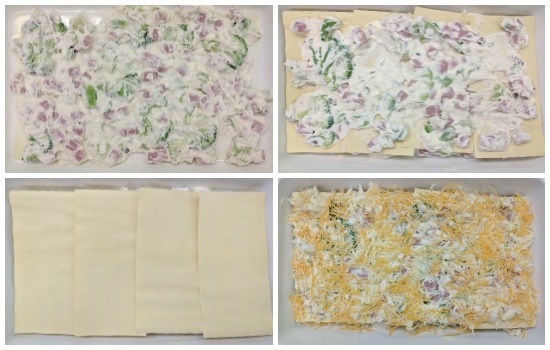 Then, layer 4 lasagna noodles over that, spread another 1/3 of the broccoli mixture, along with 1/2 cup of the mozzarella cheese and 1/2 cup of the cheddar jack cheese. Finally, finish it off with another layer of 4 noodles and the rest of your broccoli mixture and cheeses. That’s all there is to it! Ask the kids to set the table and serve everyone a slice of yummy lasagna goodness. 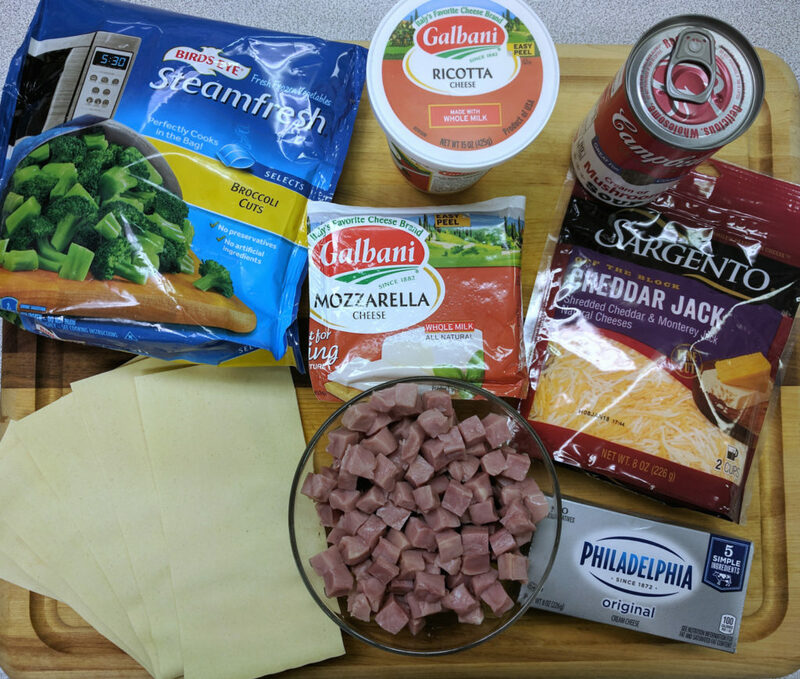 Another great thing about this Ham and Cheese Lasagna recipe is that you can prep it a day in advance. Just assemble it and keep it covered in the refrigerator. Then, when you’re ready to bake, pop it in the oven. (If you want to do this more than a day in advance, you’ll need to freeze it. Then, thaw before baking.) While it’s baking, the kids can finish their homework or you can get some other household chores done. If you’re looking for even more family-friendly meal ideas, then you should check out our free eCookbook, Cool Fuel for School: 30 Recipes for Kid-Friendly Meals. In this downloadable eCookbook, you’ll find some great ideas for everything from breakfast to dessert. How often does your family come together for dinner and what is your family’s favorite meal?